Wherever there is Chinese food and a good laugh, most likely Katie will be there with a camera. With a passion for photography, she is very excited to be managing editor for the 2016-2017 school year. Since freshmen year, Katie has been actively involved in the Communications department, and has worked her way up from staff to editor. “It’s one of the highlights of my senior year,” says Katie. 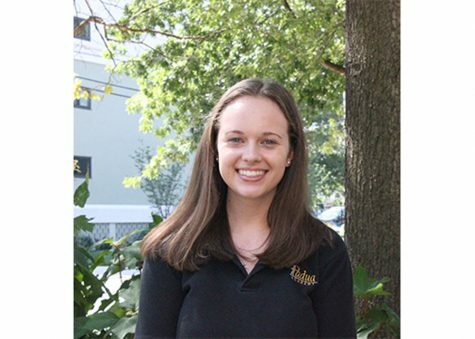 “I’ve been writing and taking picture since as long as I can remember and I can’ think of a better way to end my last year at Padua.” She has been on journalism staff and yearbook staff, jobs she said she has thoroughly enjoyed. “Both classes have helped me discover photography as a hobby. I’ve always preferred being behind the camera than in front of it. Katie plans to attend college located somewhere in Baltimore, and major in Business and Spanish. Currently, she works two jobs, and both teach her valuable lessons in the business world such as customer service, operating a business, and catering to customers and their needs. When asked what she does in her free time, Katie responded “I’m a huge art nerd. I discovered this passion around sophomore year. Some of my favorite artists are Monet, Degas, Van Gogh, and Cassat”. Katie continues by saying “Padua has definitely become a part of me. I’ve discovered a lot about myself in these past four years. The thing I’m looking forward to most this year, is making friendships in many classes and spending one last year with my Padua sisters”.